The iMac G3/600 SE released in early 2001 has only 128 MB of RAM but shares the hard disk 40 GB and the fastest processor of 7xx family – 600 Hz – with the iMac G3/600. While in color it’s more like the iMac G3/500 (early 2001). The iMac G3/600 SE features a 600 MHz PowerPC 750cx (G3) processor with a 256k on-chip level 2 cache, 256 MB of RAM, a 40.0 GB Ultra ATA hard drive, a slot loading 8X/4X/24X CD-RW drive, ATI Rage 128 Ultra (AGP 2X) graphics with 16 MB of VRAM and Firewire “400” ports as well as the in-built speakers, a 15-inch CRT display and AirPort support. The iMac G3/500 is available in funky Flower Power color. Introduced on: February 22, 2001. Processor type: PowerPC 750cx Sidewinder “G3”. On-Board Ram: 128 MB (Expandable to 1 GB (512 MB supported by Apple). Video: 15-inch (13.8-inch viewable) shadow-mask CRT screen with 1024 x 768 pixel resolution. Graphics: ATI Rage 128 Ultra (AGP 2X) video with 16 MB of VRAM. Storage: 40 GB, 5400-rpm ATA-3 up to 128 GB Hard Drive Supported. Input\Output: 2x USB 1.1, 2x FireWire 400 2x Headphone mini-jacks, Analog audio input mini-jack, Built-in stereo speakers. Internet \ Wireless connection: Optional 11 Mbit/s AirPort 802.11b (adapter required), 10/100 BASE-T Ethernet, 56k modem 4 Mbit/s. OS: Preinstalled OS: 9.1, 10.2 since January 7, 2001. OS max. upgrade: 10.4.11. Dimensions: 15.0 x 15.0 x 17.1 inch. Model No: M5521 (EMC 1857). Start up your computer while holding down the Shift key. Make sure that the hard disk that contains the System Folder is selected in the Startup Disk control panel. Choose Mac Help from the Help menu. Look at the section on how to prevent and solve problems. You may need to check for extension conflicts or reinstall your computer’s system software. If you notice that the background picture is different, you probably started up your computer using the system software on a CD instead of your hard disk. If this is the only way that you can start up your computer, reinstall the system software on your hard disk. Look for instructions in Mac Help or use the Installer application on your software install CD. Make sure the power cord is connected, make sure both ends of the power cord are plugged in securely, make sure the power cord is plugged into a working electrical outlet. Start up the computer and immediately hold down the Command, Option, P, and R keys until you hear the startup sound a second time. After resetting PRAM, you may have to reset the settings in some of your control panels. If you recently installed additional memory, make sure that it is correctly installed and that it is compatible with your computer. Important note: Don’t lift the computer using the flip-out foot. You could damage your computer. To move your computer, grab the handle on the top of the computer with one hand; with your other hand, hold the bottom of the computer. Change your seated position, stand up, or stretch whenever you start to feel tired. Frequent short breaks are helpful in reducing fatigue. Use a light touch when typing or using a mouse and keep your hands and fingers relaxed. Some computer users may develop discomfort in their hands, wrists, or arms after periods of intensive work without breaks. If you begin to develop chronic pain or discomfort in your hands, wrists, or arms, consult a qualified health specialist immediately. Allow adequate workspace so that you can use your keyboard and mouse comfortably. Place papers or other items so you can view them easily while using your computer. A document stand may make reading papers more comfortable. Eye muscles must work harder to focus on nearby objects. Occasionally focus your eyes on a distant object, and blink often while you work. Clean your screen regularly. Keeping the screen clean helps reduce unwanted reflections. 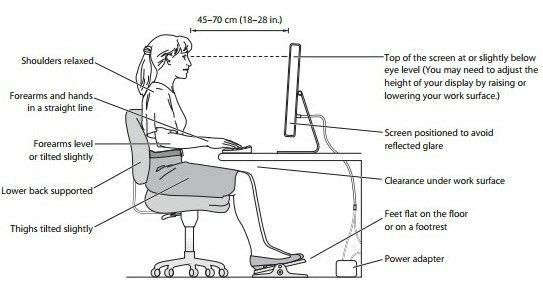 Shoulders relaxed; forearms and hands in a straight line; forearms level or tilted slightly; lower back supported; thighs tilted slightly; Top of the screen at or slightly below eye level (you may need to adjust the height of your display by raising or lowering your work surface); Scree positioned to avoid reflected glare; Clearance under work surface; Feet flat on the floor or on a footrest; Power adapter. 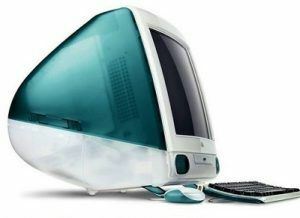 As Apple led the computers industry in colors, the company soon ran out of options. Chasing some new venues, Apple issued Flower Power modes. It was a wink at 1960s hippy years, but the Flower Power iMac has been named the ugliest iMac of all times so far. To our knowledge, the title remains unbeatable. Sell this iMac for the fast cash. Instant and Free Quote. Free and Fully Insured Shipping! Best Price Online! : Used iMac for sale!